Description of "Baith Pyar Ke Pankho Par"
म अपने प्रेम के अंकुर को शब्दों के माध्यम से पल्लवित-पुष्पित होते देख पाते हैं. सभी रचनाओं में लेखक की नवीन द्रष्टि और प्रेम की गहराई का परिचय मिलता है. छायावाद जैसी कोमलकांत पदावली और प्रकृति का आलंबन उनकी रचनाओं की विशिष्टता है. 'बैठ प्यार के पंखो पर' निश्चय ही सुधी पाठकों को एक नवीन भावबोध के संसार से परिचित करवाएगी. मन के किसी कोने में प्यार का एक कोना अपनत्व की छांह को तरस रहा था, वह निश्चय ही इन कविताओं के माध्यम से सार्थक प्रेम की अवधारणा के साथ अपने स्नेह संबल को प्राप्त कर सकेगा. Dr Sam Bansal’s present collection of Poems re-establishes the pains and pleasures of love in this material world of ours, through the medium of poetry. In the struggle of life, passion and love was left far behind, which is what he tries to recreate, albeit very successfully through these poems. The author himself says that in the quest of material life we do reach our destinations but love and longing never finds time to blossom but remains eternally thirsty. In such conditions we can see the seeds of love germinating and blossoming through the medium of words constructed in poems. In these poems one sees a new style of love and the depth of this love that the author experiences, imagines and writes about. Chayavad constructs the beauty of nature and the beloved with the beauty of verses, which Dr Bansal goes a step beyond when he is inspired by the unconscious reality who wants to transcend to “her saya” to meet him. 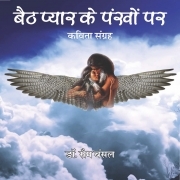 I am sure “ Baith Pyar Ke Pankhon Par” will certainly reacquaint the thoughtful readers with a world of new emotional reality. In some corner of our heart the love that was thirsty to belong to someone will certainly find its soul mate through these poems. मैं बी.ई और ऍम.ई. केमीकल इंजीनियरिंग में और पी.एच. डी. नॉन लीनीअर ओप्तोमैज़ेशन में हूँ. और मेरी दक्षता ग्लोबल मैनेजमेंट कंसल्टिंग में है. मैंने एक सौ से जयादा अंतर्राष्ट्रीय जर्नल्स में पेपर्स लिखे हैं और कई किताबें भी टेक्नोलोजी मैनेजमेंट में जो जॉन वाइली द्वारा छापी गई हैं. परन्तु साहित्य और खास तौर से कविताओं का लिखना मेरा खास शौक रहा है. इसे पढ़ाई और कार्यकाल के दोरान मैंने दबा के रखा पर आखिर कब तक ऐसा होता रहता? अंत में साहित्य और कविता का पलड़ा भरी रहा और यह संकलन तैयार हो ही गया. आशा है आप सभी को इसे पढ़ कर उतना ही आनंद आयेगा जो मुझे इसे लिखते समय और जब जब भी इसे पढ़ता हूँ तो आता है. मेरे से आप विचारों का आदान प्रदान drsambansal@gmail.com पर कर सकते हैं. I am B Chem Eng. and M Eng. in Chemical Engineering and Ph D in Non Linear Optimization. My expertise is in Global Management Consulting. I have published more than 100 papers in International Journals. I have written several books that were published by John Wiley. But literature and more importantly poetry has been my natural inclination and love. However during studies and then in the pursuit of professional excellence, I kept this poetic interest suppressed. But how long could suppression prevail? In the end literary tendencies won over and this collection got completed. Hope you all enjoy it reading as much as I enjoyed it during its creation. Any time I reread it, I still enjoy it just as much. Write to me at: drsambansal@gmail.com. Reviews of "Baith Pyar Ke Pankho Par"